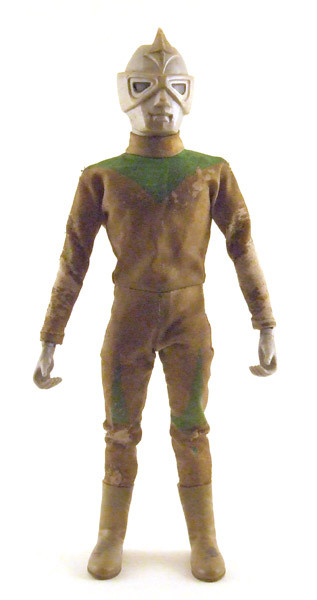 Mirrorman was the sixth figure in the Allies of Justice line, released in January of 1972. Mirrorman, the TV series, was another Tsubaraya production (the company who produced the Ultra series) and aired from December 5th, 1971 to November 26th, 1972. The show is very similar to UltraSeven, in that it was a more serious sci-fi series. It also featured such trademarks as a team of humans battling to save Earth, in this case named Science Guard Members (SGM), and a transformation gimmick. To transform into Mirrorman, the main character, Kyôtarô Kagami ("kagami" is Japanese for "mirror") must stand in front of a reflective object and flash his Mirror-Pendant.